Washburn students were halfway through the last day of a 10-day archaeological dig when Daniel Hougland’s trowel scraped against something that wasn’t soil. “That’s a big chunk of charcoal,” he said. Leaning over the unit – a hole about six feet long, two feet wide and now 80 centimeters deep – he ponders the best way to get at what will become a significant find. Laura Murphy, an assistant professor of anthropology in her first year at Washburn, makes her way to the site on a bank 20 feet above a spring where a frog sits croaking. The prairie wind picks up, the morning fog fades, and clouds provide relief from the summer sun. By now, Hougland also uncovered bone fragments and teeth. They’ve found similar artifacts on this trip, but these surround a larger object in the middle. “So what’s the plan of attack,” the eager student asks his professor. Murphy brought three Washburn students and one University of Kansas graduate student to this cattle ranch in southwest Kansas, 10 miles south of Meade and 10 miles north of the Oklahoma border, to look for evidence of Kansas’ earliest humans. Many decades ago, a mastodon or mammoth was discovered there, and that could mean humans were there thousands of years ago. 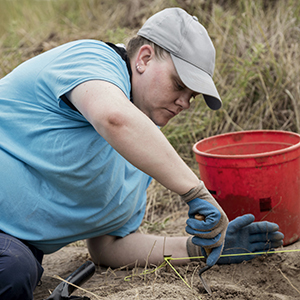 Lori Holstrom, a student working on another unit at the site that morning, has loved digging in the ground since childhood. She works in the Mulvane Art Museum at Washburn and wants to work professionally in museum collections after graduation. Like classmate Adrianna Hendricks, this was her first field school, and they both had new experiences on the trip. Aside from bugs, sunburns and curious cattle, being out there also gave them a chance to survey the landscape to decide the best excavation sites. The team targeted buried soils, or former stable land surfaces, where people once walked and artifacts and features, such as ancient fire pits, are preserved in place. The sides of cliffs, called cut banks, expose these layers. As Hougland meticulously pulls artifacts from the buried soil and bags them for later analysis, Murphy reminds him to stay at 80 centimeters and not go much deeper yet. It’s 10:30 a.m., and a phone alarm reminds them it’s lunchtime. They had been working since 6:30. “You want to stay, don’t you,” Murphy asks Hougland. “I do. So bad. My lunch is here.” He climbs out, grabs a can of SpaghettiOs from his bag and eats it cold. It would be a few more hours before they get the feature completely uncovered. It will be weeks or months before they know exactly what they found. 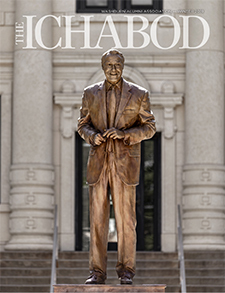 To do so, Murphy raised money on Impact, a crowdfunding platform hosted by the Washburn University Alumni Association and Foundation, to purchase lab equipment that will help determine the types of stone tools and animal bones uncovered at the site, and provide climate information from soil samples. “The right equipment would increase the value of what we’re doing,” Hougland said. Without the proper equipment, Murphy could only hypothesize that the rock feature they found was an archaic-aged cooking feature. 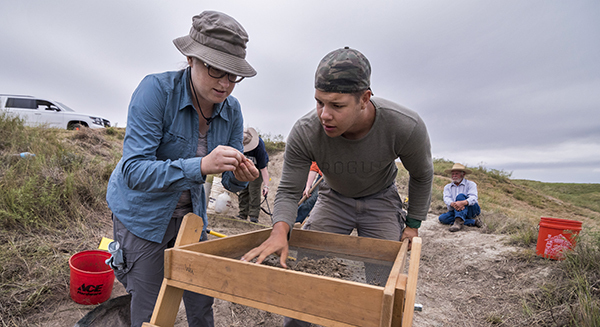 Lab equipment for archaeology students to study their findings was fully funded in 2018 on Washburn's Impact crowdfunding site, thanks to the generosity of donors. Read more about current and funded projects and consider a gift to help students enrich their Washburn experience.